A Norfolk Broads cruiser, the boat "Sparkling Horizon" is a cruiser belonging to the boat-yard Richardson’s Cruisers, and is good for exploring the rivers around Hickling & Stalham. Sparkling Horizon sleeps 2 people, with the bedrooms laid out as 1 double. Steer cruiser from the forward steering. You get a 240 volt system on board Sparkling Horizon. You have heating on Sparkling Horizon. There's no need to bring bed linen, as it is all provided on Sparkling Horizon. 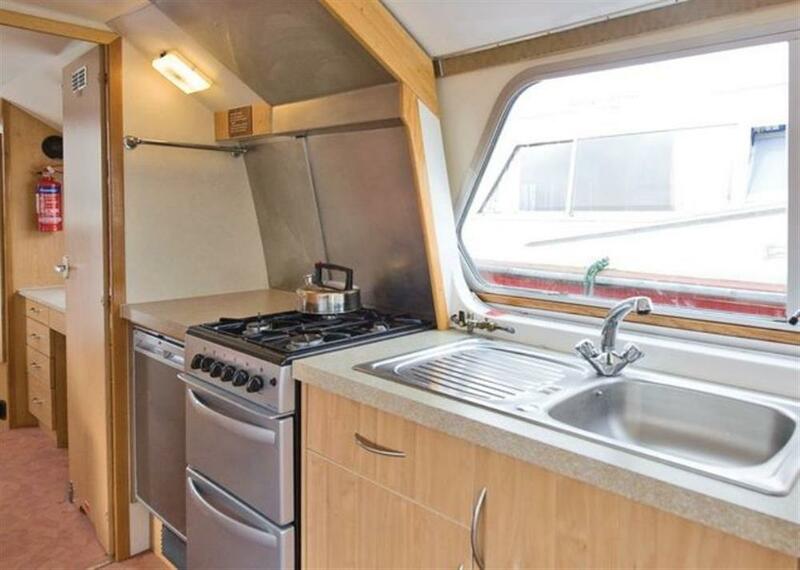 You can watch TV while staying on this boat. You can watch some DVDs while staying on this boat. There is a CD player on Sparkling Horizon. There is a radio on Sparkling Horizon. You even get a hairdryer on board. There are bed linen and duvets available. There is a shower for you to use on Sparkling Horizon. Plenty of space to park your car. You have a bow thruster on Sparkling Horizon to make the steering easier in those tight spots. This is the plan of Sparkling Horizon. To give you an idea of the size of your boat, Sparkling Horizon is 9.45m x 3.66m (31ft x 12ft). Commodore - at Richardson’s Cruisers, in Hickling & Stalham. Commander - at Richardson’s Cruisers, in Hickling & Stalham. Swan Regal - at Richardson’s Cruisers, in Hickling & Stalham. Blue Gem - at Richardson’s Cruisers, in Hickling & Stalham. Bright Gem - at Richardson’s Cruisers, in Hickling & Stalham. Swan Renown - at Richardson’s Cruisers, in Hickling & Stalham. Autumn Horizon - at Richardson’s Cruisers, in Hickling & Stalham. Tropic Horizon - at Richardson’s Cruisers, in Hickling & Stalham. Moon Voyager - at Richardson’s Cruisers, in Hickling & Stalham. Fine Horizon - at Richardson’s Cruisers, in Hickling & Stalham. Sunlit Horizon - at Richardson’s Cruisers, in Hickling & Stalham. Moon Enterprise - at Richardson’s Cruisers, in Hickling & Stalham. Mystic Horizon - at Richardson’s Cruisers, in Hickling & Stalham. Bright Horizon - at Richardson’s Cruisers, in Hickling & Stalham. Moon Beam - at Richardson’s Cruisers, in Hickling & Stalham. Moon Adventure - at Richardson’s Cruisers, in Hickling & Stalham. Coral Horizon - at Richardson’s Cruisers, in Hickling & Stalham. Moonraker - at Richardson’s Cruisers, in Hickling & Stalham. Blue Horizon - at Richardson’s Cruisers, in Hickling & Stalham. Pearl Horizon - at Richardson’s Cruisers, in Hickling & Stalham. Western Horizon - at Richardson’s Cruisers, in Hickling & Stalham. Glistening Horizon - at Richardson’s Cruisers, in Hickling & Stalham. Spring Horizon - at Richardson’s Cruisers, in Hickling & Stalham. Crystal Horizon - at Richardson’s Cruisers, in Hickling & Stalham. Clear Horizon - at Richardson’s Cruisers, in Hickling & Stalham. Dawn Horizon - at Richardson’s Cruisers, in Hickling & Stalham. Golden Horizon - at Richardson’s Cruisers, in Hickling & Stalham. Summer Horizon - at Richardson’s Cruisers, in Hickling & Stalham. Moon Discovery - at Richardson’s Cruisers, in Hickling & Stalham. Distant Horizon 1 - at Richardson’s Cruisers, in Hickling & Stalham. Southern Horizon - at Richardson’s Cruisers, in Hickling & Stalham. Monaco - at Richardson’s Cruisers, in Hickling & Stalham. Swan Reflection - at Richardson’s Cruisers, in Hickling & Stalham. Swan Rapide - at Richardson’s Cruisers, in Hickling & Stalham. Quest - at Richardson’s Cruisers, in Hickling & Stalham. Swan Roamer - at Richardson’s Cruisers, in Hickling & Stalham. Swan Ranger - at Richardson’s Cruisers, in Hickling & Stalham. Swan Rapture - at Richardson’s Cruisers, in Hickling & Stalham. Southern Gem - at Richardson’s Cruisers, in Hickling & Stalham. Swan Romance - at Richardson’s Cruisers, in Hickling & Stalham. Dominica - at Richardson’s Cruisers, in Hickling & Stalham. Swan Radiance - at Richardson’s Cruisers, in Hickling & Stalham. The Cruiser above is Sparkling Horizon - in the Richardson’s Cruisers region of Hickling & Stalham. We've also listed several other boats in Richardson’s Cruisers; or for a bigger choice, look at all the boats available in Hickling & Stalham. Hopefully you'll find something to suit your holiday needs!